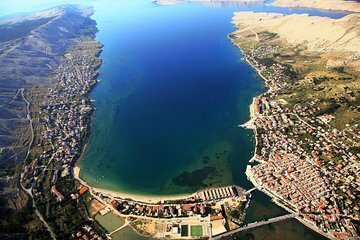 Visit the island of Pag and a historical vineyard on a private day trip from Zadar. Journey to rocky Pag north of Zadar and discover its distinctive culture and rugged landscapes. Explore the Lace Museum at Pag Town and visit a family dairy to sample award-winning ‘paški sir’ cheese. Finally, call at the scenic Royal Vineyards near Petrcane for a tour and wine-tasting. Zadar hotel pickup and drop-off included, with entrance fees at own expense.